angus. org To view complete pedigree page and EDPs, click on the provided link and enter Reg. # in Animal Search Box at the top right-hand corner of the page. This guy did pretty darn good for a dam that had a bad limp for almost 2 months of the pasture season. 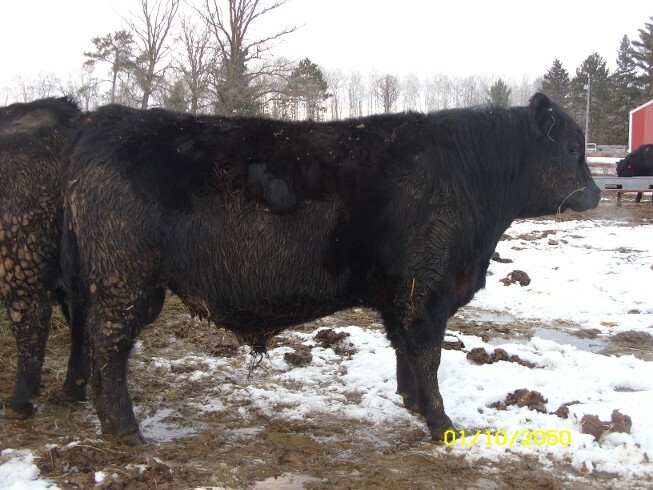 Her first 2 calves had an average 205 day ratio of 100. This is the only yearling bull we are offering that didn't quite make the 700 lbs. threshold we strive for. He weaned off at 677 lbs. @ 204 days. He's out of an A.I. sire who's renowned for his ability to pass on the Docility trait; rated in the top 1% of breed. His sire also ranks in the top 1% of breed for heifer pregnancy.